if there’s one things my kids repeatedly ask for for an afternoon snack, it’s popcorn. they love it. and who would blame them? it’s so much fun to watch the kernels pop, and then to get to eat them with some salt and butter…it’s delicious! one afternoon we switched it up with some caramel popcorn. now my youngest always requests it! though, i think we’ll just use it as a “sometimes” snack – a little treat! 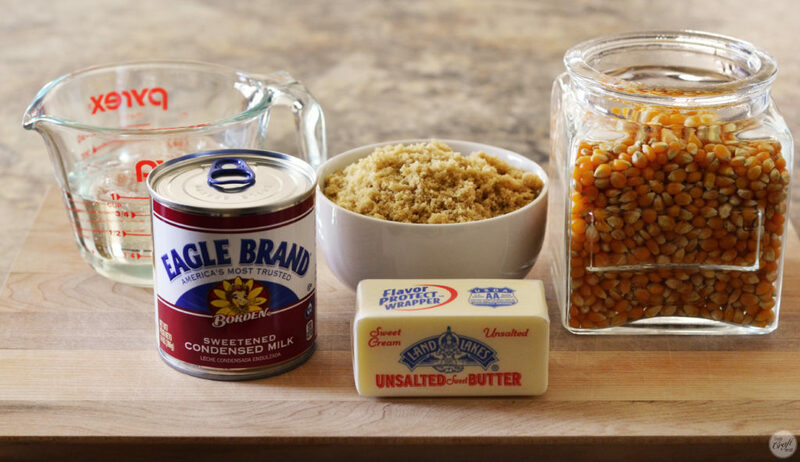 but it’s a little treat that’s really easy to make and only uses 5 ingredients: popcorn kernels (you could use microwave popcorn if you wanted, but i’d use one with the least amount of butter and salt/flavorings on it), karo syrup, sweetened condensed milk, butter, and brown sugar. you probably have all these things in your pantry, right?! and you know they’re going to taste really good together…. the first step is to pop the popcorn. you’ll want to use the biggest bowl you own. mine’s pretty big, but i still had to use a second one and divide the popcorn between the two. and that’s okay, too. 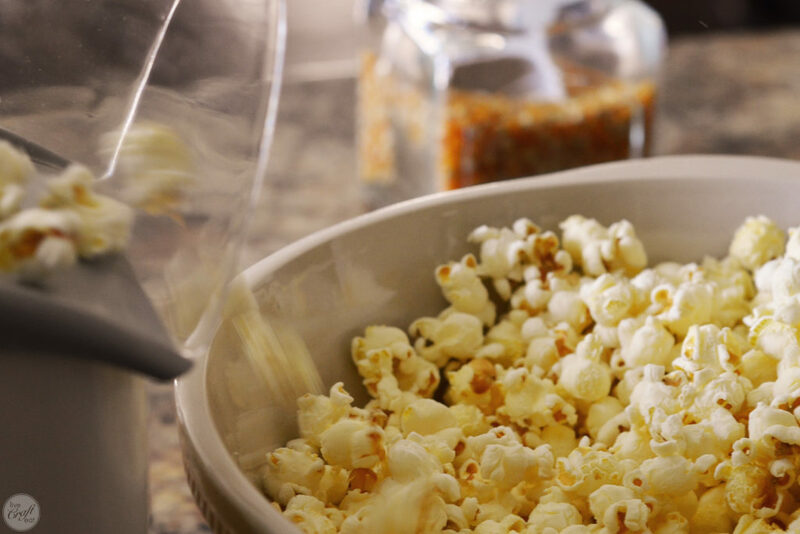 for this recipe you need approx 24 cups of popped popcorn, which means about 1 3/4 to 2 cups un-popped kernels. it’s a lot of popcorn! you’ll also want to sift out any un-popped kernels. 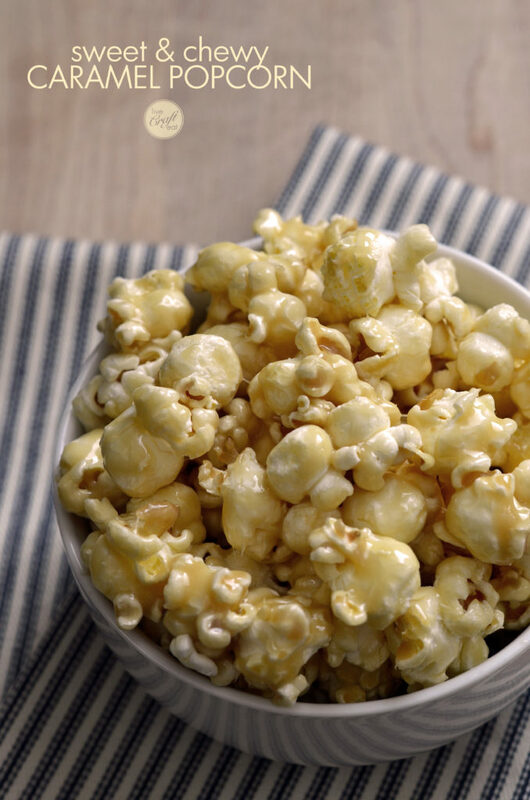 nobody wants to bite into an amazing handful of caramel popcorn only to bite down on a kernel. ouch. once the popcorn is all popped, we need to make the caramel. 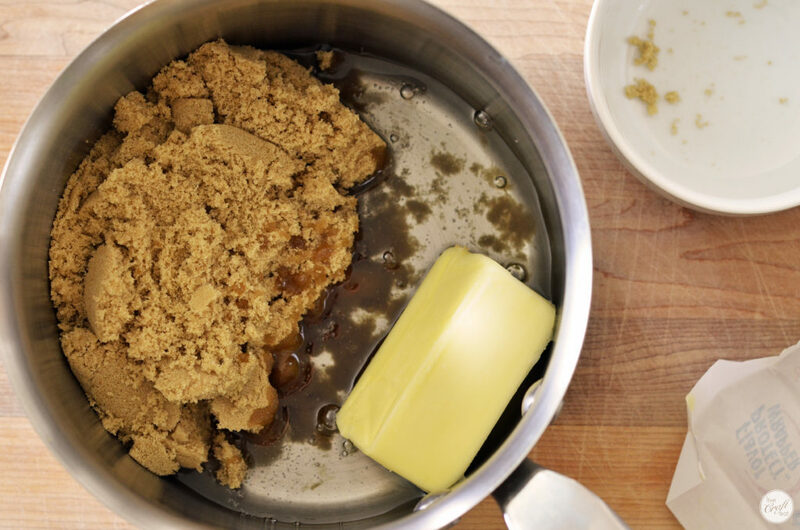 combin the butter, karo syrup, and brown sugar in a medium-size saucepan. bring it to a boil, and boil for 5 minutes, stirring constantly. when the 5 minutes are up, remove the pan from the heat and stir in the sweetened condensed milk. it will turn everything to that amazing caramel color. sweet. 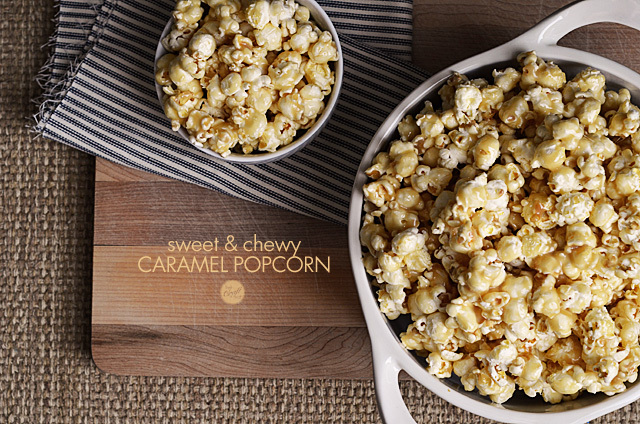 now all we have left to do is drizzle the caramel on top of the popcorn! 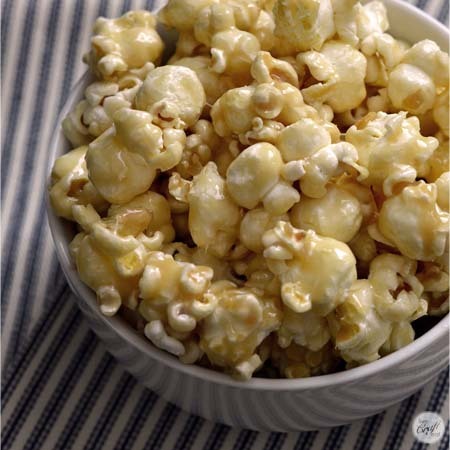 (if you divided your popcorn into 2 bowls like i did, just make sure you divide the caramel evenly between the 2 bowls.) doesn’t that look heavenly?! 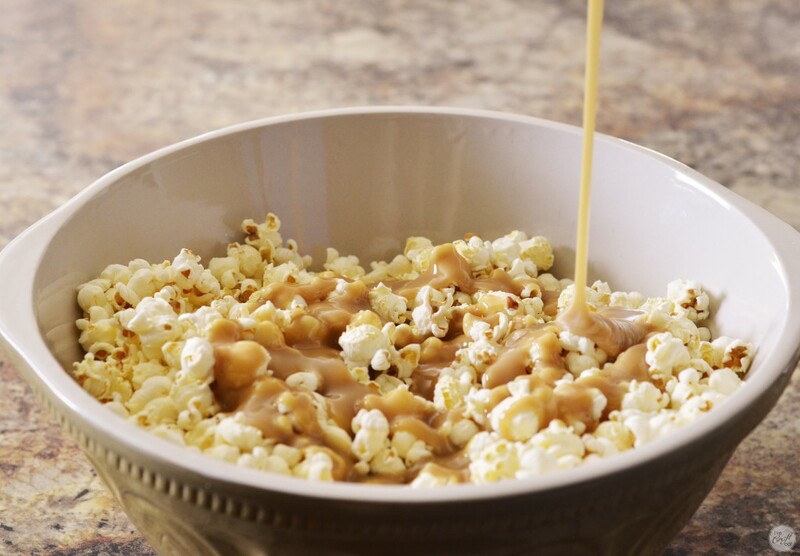 you’ll need to quickly stir in all of the caramel to coat the popcorn while it’s still warm. 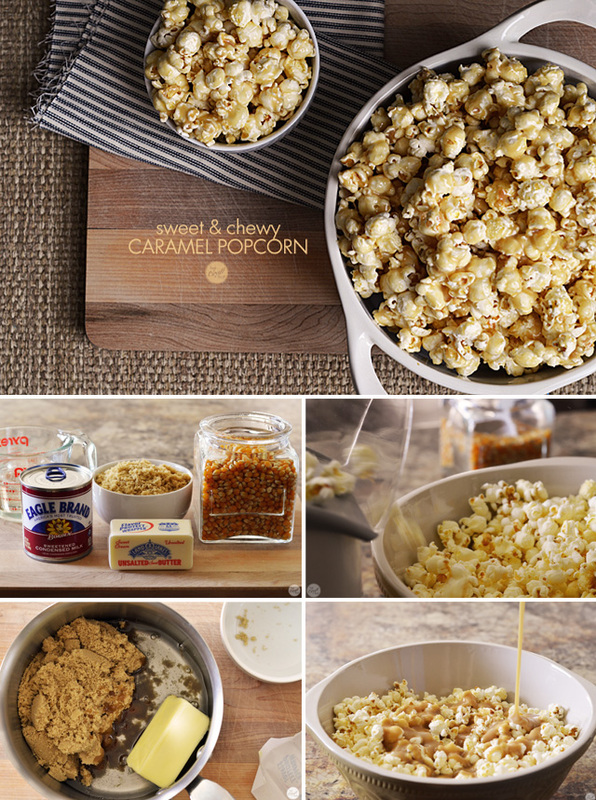 and when you’re done, you’ll end up with this amazingly sweet and chewy and gooey caramel popcorn. don’t you just want to pick up one of those pieces right now and eat it? hmmm…i might have to make some more this afternoon…maybe i’ll add some peanuts this time. that would be yum! pop popcorn into a large bowl. in a saucepan, combine brown sugar, butter, and karo syrup and bring to a boil. boil for 5 minutes while stirring constantly. remove from heat and slowly add sweetened condensed milk. combine well. pour over popcorn and stir to combine. enjoy! 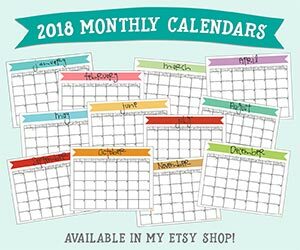 if you like this post, make sure you PIN IT so everyone else can enjoy it, too!